We have evil “Shovel Men” at our apartment. They are in league with the “Crack of Dawn” commuters. Ever since it started snowing in Boston our apartment complex hired a team of men to keep the walkways, courtyard, and driveways clear. I truly do appreciate their dedication. What I don’t appreciate is that they have a shift at 3:00 AM. In two weeks I’ve been woken up numerous times to the “harmonious” sounds of loud pounding, digging, and salt spreading. Now, if the “Shovel Men” are in hibernation for the evening than without a doubt the “Crack of Dawn” commuters will start scraping their windshields at 6:00 AM. I’m ready to move into our spare room for the winter. Anyway, I’ve been up since around 3:30 AM and I’m now sick of trying to watch “A Walsh Family Christmas” on YouTube, so I decided to cook something. It had to be brainless and quick; something that didn’t involve any frantic KitchenAid noise. 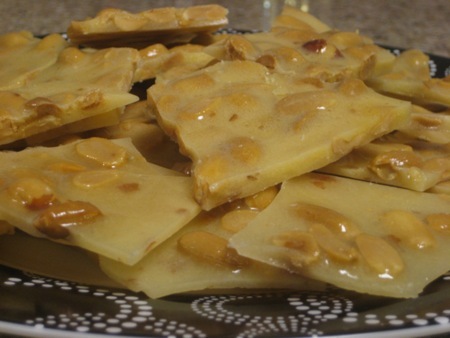 My mom’s Peanut Brittle seemed like the way to go. This crunchy treat is created completely in the microwave and it takes less than 10 minutes to make from start to finish (not including cooling time). You’re going to freak when you try it. 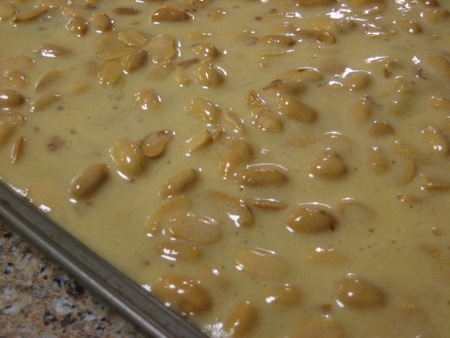 In my sleep deprived state I’m kind of nutty myself (thankfully I’m on vacation) so we’re going to call this dish: Mummy’s Microwave Peanut Brittle. Except when I read “Mummy” I think of that Doctor Who episode where a creepy child wanders around London eerily inquiring to everyone it meets, “Are you my mummy?” See…I told you I was a little off today. Are You My Mummy’s Brittle? 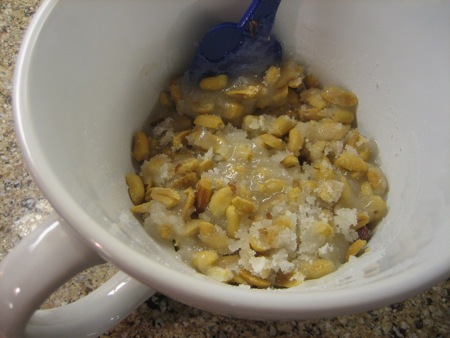 In a microwave safe bowl, stir together the sugar, syrup, salt, and peanuts. 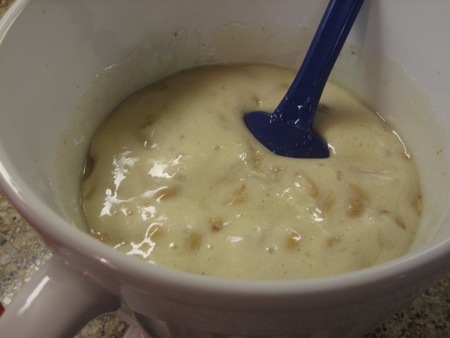 Microwave the mixture on High for 5 minutes and 30 seconds. Be careful! The bowl may be very hot. 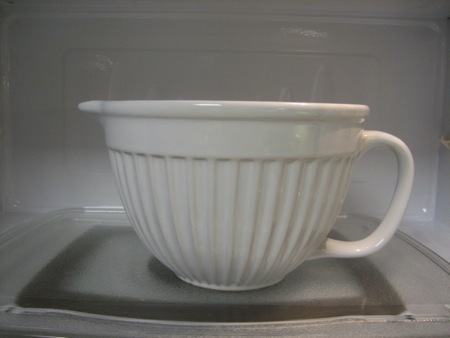 Use pot holders when moving it in and out of the microwave. Gently stir in the tablepoon of butter and the teaspoon of vanilla. 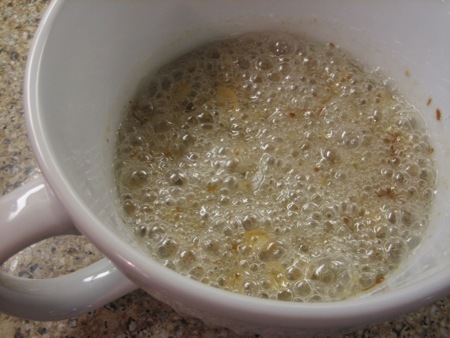 Stir in the teaspoon of baking soda (do not be alarmed, the mixture will thicken and change color) and quickly pour onto a buttered cookie sheet. 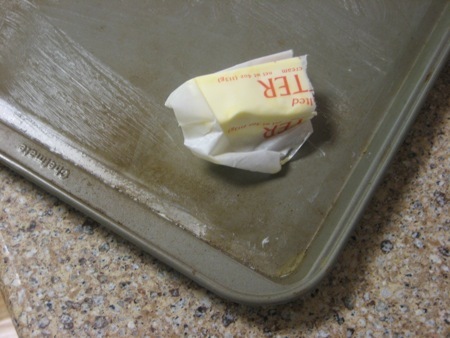 Tilt the pan to spread. Note: It will not cover the entire sheet. Cool completely. Break into pieces and share with a friend (maybe The Doctor if he shows up in his Tardis). THIS IS THE BEST RECIPE EVER!!! Any mention of 90210 gets a compliment from me! Previous post: All Aboard The Jolly Express Gingerbread Train!